If you’re going to eat a vegetable, make it this one! 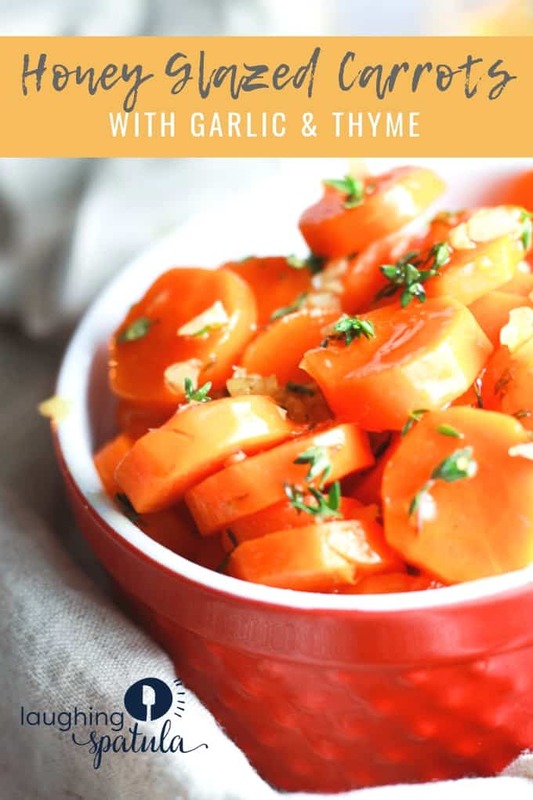 These Honey Glazed Carrots with Garlic and Thyme taste like savory candy, and they’re absolutely delicious, and perfect for any holiday- Thanksgiving, Easter, Christmas, you name it- they’ll do! An easy 15 minute side dish that will put a smile on your families face! 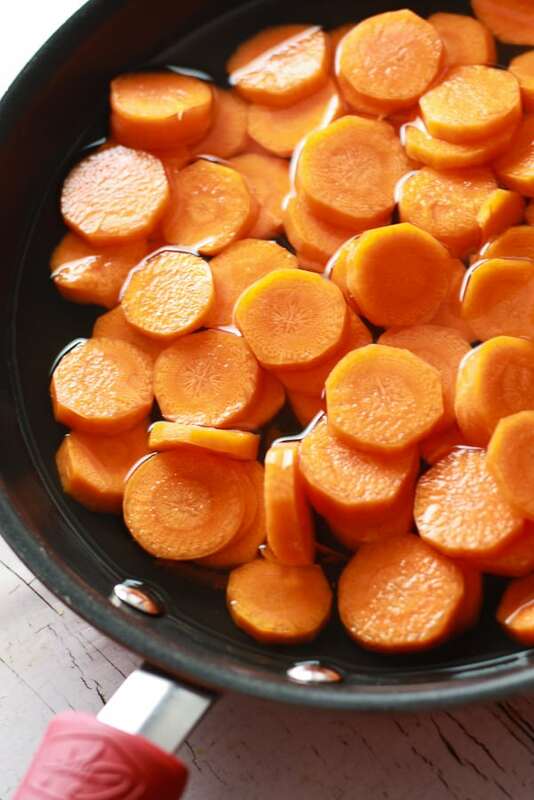 You’ll simmer these carrots in about 1 inch of water in a shallow stovetop pan for about 2 minutes- any sooner and they’re too crunchy, any longer and they’re squishy. Taste test before you pull them out of the simmering water to make sure they’re the texture you’re looking for. Me? I like mine a little crunchy. When too soft, they remind me of canned carrots. Bleck. Simmer in 1 inch of water for about 2 minutes. 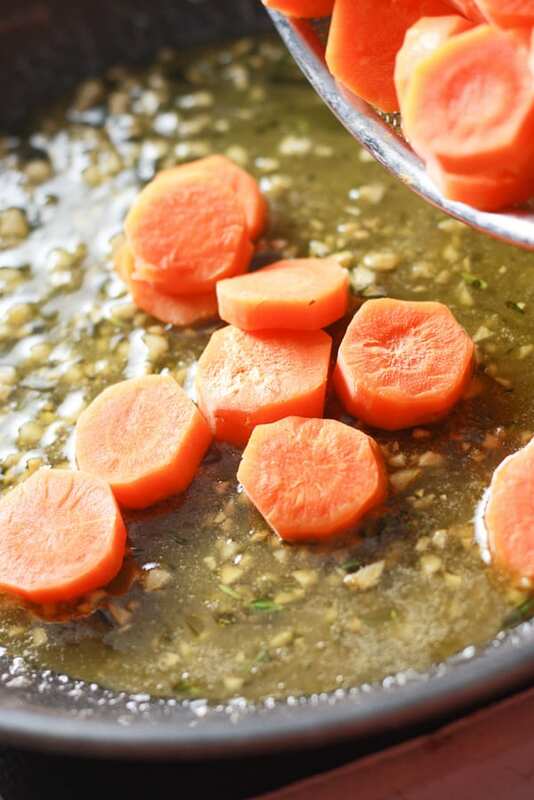 Once done simmering, strain your carrots, and start to make your glaze sauce. First step? 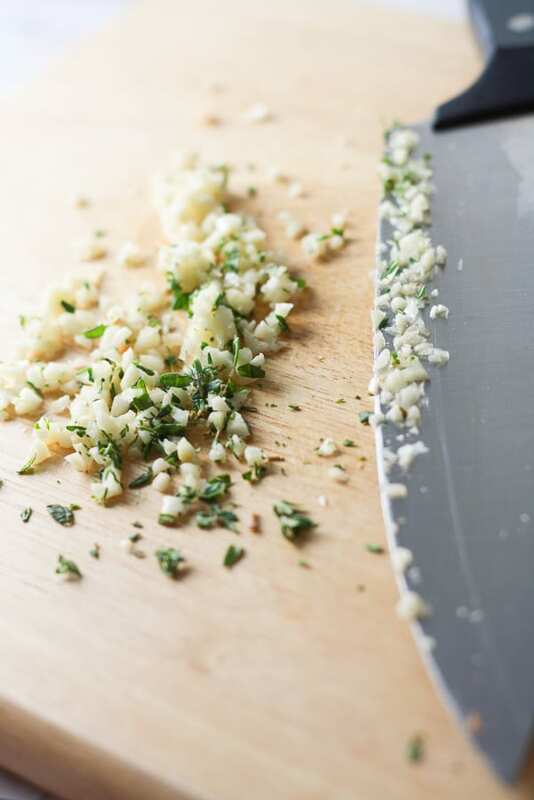 Chop your garlic and fresh thyme! 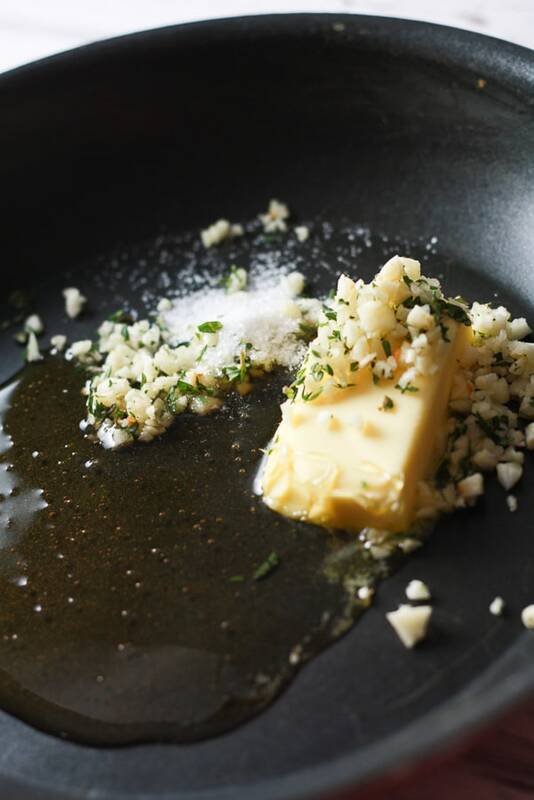 Melt your glaze ingredients in a pan until they start to bubble- once simmering, cook for an additional 2-3 minutes. Basically- you’re making a savory caramel sauce! Add your carrots, toss, and serve! 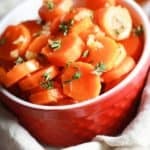 Remove the sauce from heat, add your carrots, toss, and serve- YES! It’s that easy! Look at that sticky, gooey goodness! DO NOT USE CANNED CARROTS. I repeat- DO NOT USE CANNED CARROTS. They won’t have the texture nor the taste that makes these babies so delicious. Spend the extra 5 minutes, chop and blanch your own. I used Kerrygold butter; it’s delicious and so fresh- but any butter will do just fine. I sliced my carrots into rounds, but you could do slices as well for a more rustic look. Not a fan of blanching? Try roasting! Rough cut your carrots, then roast your carrots to give them a nice char, then toss in our honey glaze with garlic and thyme. Yum! Need other great vegetable side dishes? Check out this Creamy Cauliflower Au Gratin- Vegetarians, rejoice! This is one outstanding dish. Big cauliflower fan? Check out our Cali-rice with Feta and Mushrooms. Want more starch and less veg? Twice Baked Potato Cups are right up your alley for sure! Onto the next dish- clink! A delicious, savory side dish perfect for any holiday or dinner! 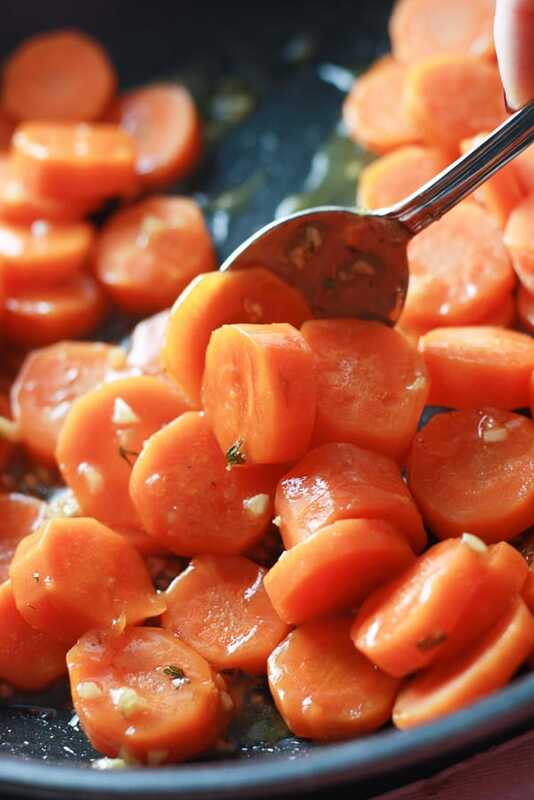 Place carrots in 1-1.5 inches of water in shallow stovetop pan. Heat until simmering. Let simmer for 2 minutes. Strain carrots, and set aside. In stovetop pan, combine remaining ingredients, and turn stove on to medium heat. Once simmering, continue to cook for 2 minutes, then turn heat off. Add carrots and toss in liquid mixture. Serve and enjoy! DO NOT USE CANNED CARROTS. I repeat- DO NOT USE CANNED CARROTS. They won't have the texture nor the taste that makes these babies so delicious. Spend the extra 5 minutes, chop and blanch your own. I used Kerrygold butter; it's delicious and so fresh- but any butter will do just fine. 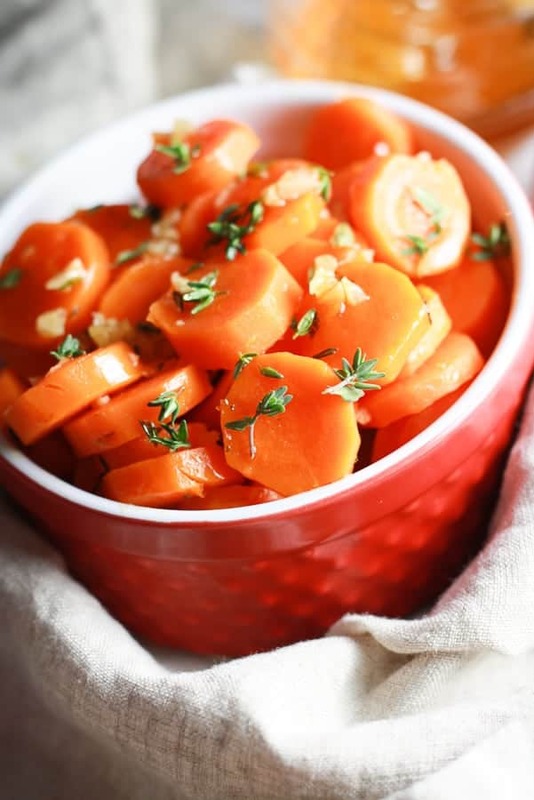 Did you make these Honey Glazed Carrots with Garlic and Thyme? 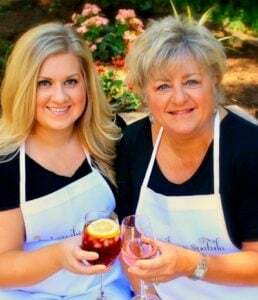 Tag us on Instagram #laughingspatula or @laughingspatula- we love to see your pics!